I didn't know I would be going to this game until literally the day before the game. A great deal had come up on a laptop, but the catch was that I would have to pick it up from Huddersfield. But I didn't mind. Secretly I had been hoping that I could tie the 2 things in, my old MacBook was getting a bit long in the tooth, and I had wanted to go to Alfreton for a long time. I had originally been planning to go to Alfreton in October for their match with Grimsby. 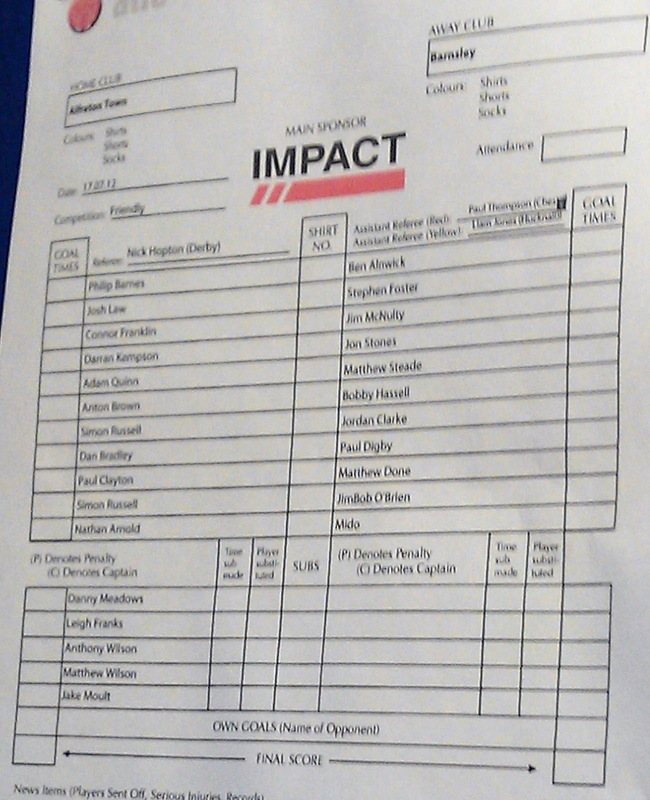 But league games at The Impact Arena are an eye-watering £18, and I didn't fancy shelling out on top of petrol. 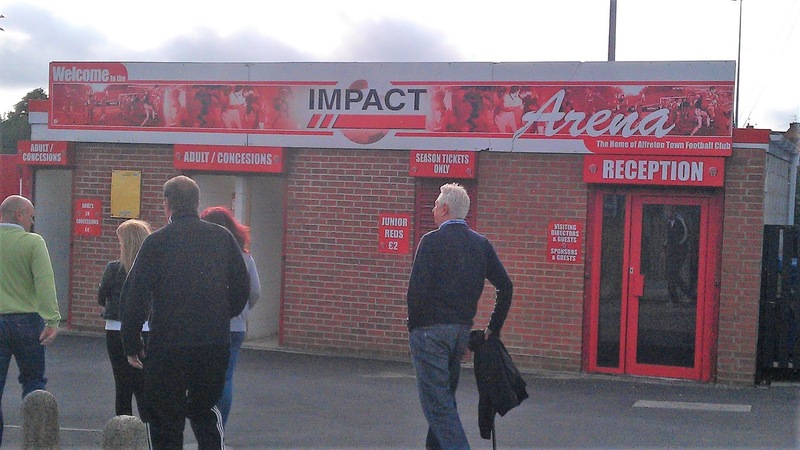 Cost for this friendly against Barnsley was a more wallet-friendly £8, and it freed up another date to see a different ground, a long trip to Barrow seems favourite at the moment. On the day, I left at 11am, first stopping at Blaby and Whetstone Athletic FC, just off the M1 in Leicestershire, a fairly basic ground, but well kept and with good community facilities for the youngsters. I wasn't due to get to Huddersfield till 5pm, so I went to see my mate David in Liversedge for a short while. I had not met him before, only chatted on Facebook. But I was delighted to find that he was just as great in real life as behind an iPad! I left plenty of time to get to Huddersfield and actually got there at 4.15. I didn't have to wait long and after checking over the goods and transferring the money, I was away just after 5 PM. It really was a great deal, a MacBook Pro 2010 model, 8GB Ram, 2.6ghz I5 processor, 500GB Hard Disk, Apple Mighty Mouse and Turtle Beach wireless headphones for £640. Usually, this sort of package would go for a good £200 more on eBay, so I was pretty chuffed with myself and it was turning out to be a good day, one of the best in fact! Before I left Huddersfield, I popped into one of my favourite shops, Home Bargains (you can tell I like saving money!) to get some stuff for the footy and a few other things. Eventually, I left Huddersfield at 5.30, and it was a reasonable drive for the rush hour, arriving in Alfreton at 6.45. I saw they were charging £3 for parking but fancied saving money so used street parking instead. I must have gone back to the car 3 times to double check that my boot was locked. After I had sorted everything out, it was just before 7 when I got to the ground. I took a few pictures of the outside before going in, and straight to the club shop. 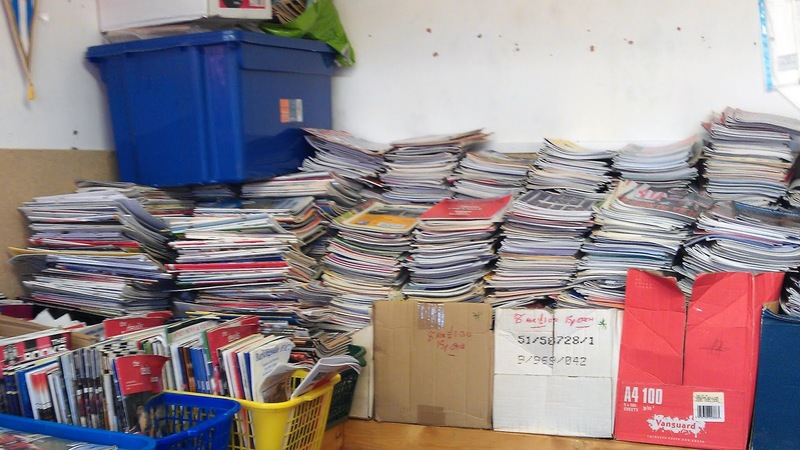 It had an enormous amount of stock, tens of thousands of programmes, books, fanzines and other reading matter, bursting at the seams it was. And on top of that, a good range of club merchandise. It was tricky to find what you wanted, given the volume of the stock. In the end, I settled for 11 fanzines, 2 Brian Clough books, the days' programme and a scarf for £11.25. 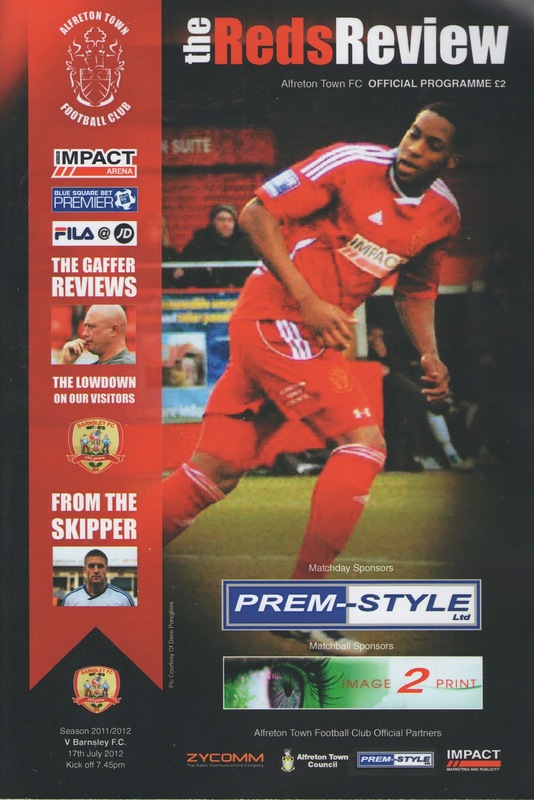 The match itself was pretty decent, with Alfreton doing well against the whole of the Barnsley first team squad. In the end, it was 2 goals from former Chesterfield striker Craig Davies that settled it, he came on in the second half along with one of my favourite players, hard-working midfield battler David Perkins. 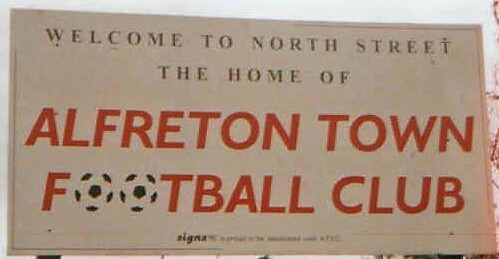 Alfreton never looked out of their depth though and pulled a goal back scored by a trialist wearing the number 16 shirt. All in all a very enjoyable evening, and a decent journey home, apart from parts of the M1 that delayed me for half an hour, due to those invisible workmen again. I got in just after midnight, and couldn't sleep, so I had a few rum and Irn Bru's and set about setting up my new laptop and erasing my old one ready for sale. Even at 5am, I was still wide awake, but forced myself to go to sleep, eventually getting about 2 hours sleep. THE IMPACT ARENA is a fairly decent stadium for this level, though maybe with a few too many seats for my liking. The one end of terracing is given to away fans, at least partially anyway. It's quite big and only partially covered to the rear, however, the steps are a bit shallow so you might not get a great view if you are short. 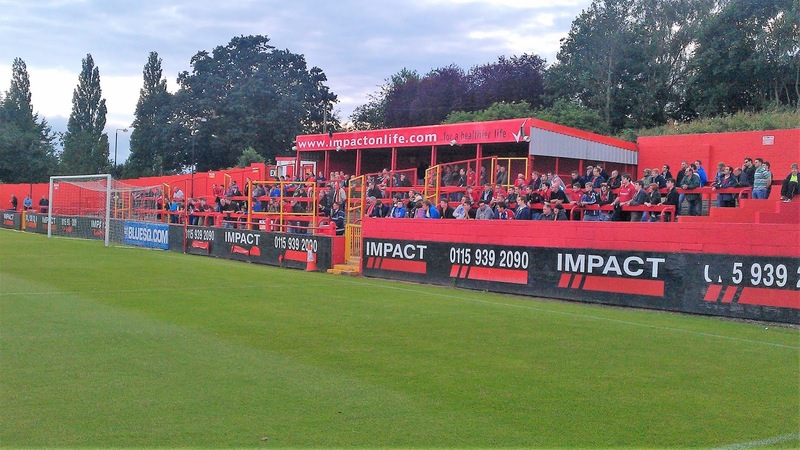 The most modern stand is the one with the bars and changing rooms at the back, around 500 can be located in this area, despite it stretching the full length of the pitch. The other 2 sides are blue seating, which doesn't blend in that well to the ground. Behind the goal is uncovered, and the other side is only partially covered, but at least you can get good legroom and a decent view, even if you might get wet! I'd imagine these were installed as an economical way to meet ground grading criteria, I am not sure what was there beforehand. The best part of a trip to Alfreton is the club shop as I have already mentioned. There is also an excellent tea bar which serves really nice food. 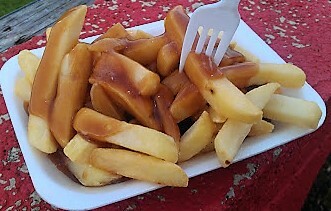 I liked the Gravy and Chips at £2. The bar was also decent, not an amazing selection bur lots of stuff on the walls to look at in terms of club history and others clubs pennants. Overall I'd give it the thumbs up and say it was well worth a visit, everyone I spoke to was really welcoming.